NASSAU, THE BAHAMAS — On September 26, 2018, Vantage Airport Group officially dedicated new artwork to commemorate Nassau Airport Development Company’s (NAD) tenth anniversary as operators of Lynden Pindling International Airport. In April 2001, during NAD’s tenth anniversary celebrations, Vantage announced that a Bahamian artist had been commissioned to create the tenth anniversary gift and revealed renderings at a cocktail reception. The Way, created by Bahamian artist Dede Brown, is a whimsical and colorful aluminum sculpture depicting underwater life and features more than 30 unique species of reef fish found in Bahamian waters. The artwork is located in the International Arrivals terminal and will be seen by more than 3.3 million passengers moving through the airport annually. On hand for the dedication were George Casey, Chair and CEO of Vantage Airport Group, NAD’s Board of Directors, the company’s executive management team along with artist Dede Brown. NAD also invited some of the country’s top high school art students to participate in the dedication and tour additional art pieces at the airport. “With this composition, we are deepening that uniquely Bahamian sense of place at LPIA. 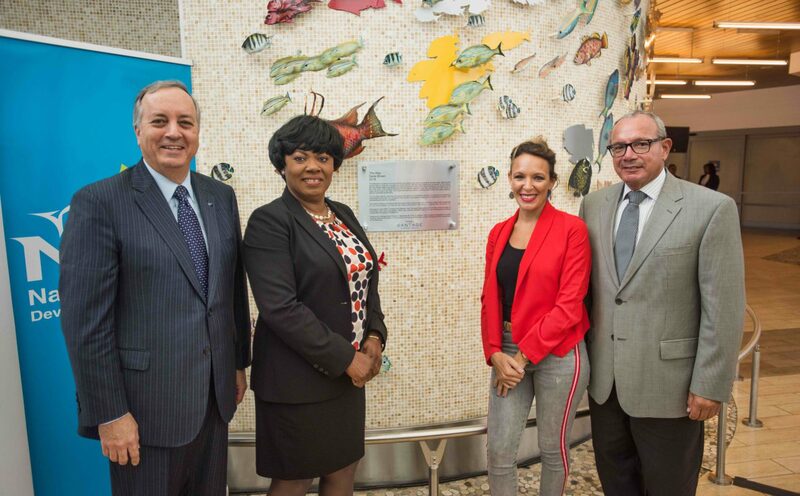 This artwork also represents the partnership between Vantage, NAD and the government of The Bahamas, which has, in its 10-plus years, created world-class airport facilities, built a team of dedicated employees, invested in its community and warmly welcomed thousands of passengers,” Casey said. Vernice Walkine, President and CEO of NAD, accepted the gift on behalf of her team in Nassau. Artist Dede Brown also brought remarks during the event and shared her process for creating The Way. Born in Freeport, Grand Bahama, Brown’s body of work features paintings, sculptures and unique installations. Her art has been displayed in exhibitions in The Bahamas, England and in various print and online publications. This is Brown’s second piece commissioned for LPIA. Passengers travelling to the Family Islands through the Domestic Departures lounge can experience her stunning piece Taking Flight, a sculpture featuring a flock of 84 life-sized pink Bahamian flamingos.